I’m a fourth-generation horticulturalist from Redland Bay and have been involved in the family business since the early 1980s. I grew up surrounded by plants and have always felt very connected to the industry. Earlier in my career, I studied in New Zealand, and returned to work full time in the nursery in 1983. Today, we own and operate Greenlife Solutions which specialises in young plants of frangipanis and advanced palms for landscape use. 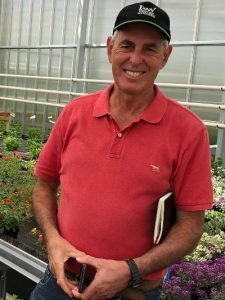 I’m also General Manager of Proven Winners Australia, a marketing cooperative for new flowering ornamentals and shrubs. What do you see as the opportunities for the nursery industry? The nursery industry is very broad. It provides starter stock into the food, fibre and foliage supply chain. As these industries continue to grow – such as trees, fruits and nuts – so does the opportunity for nurseries to increase their production. Levy funded programs such as Plant Life Balance and 202020 Vision continue to gain momentum as environmental and social solutions to cool our climate and green our cities. Together, they have generated greater awareness on the importance of green life in our homes and our communities, which will reflect in increased sales opportunities. Why did you decide to join the nursery Strategic Investment Advisory Panel (SIAP)? I had previously been involved in other national nursery committees and found them to be incredibly useful and a great way to give back. The same can be said for the Nursery SIAP. You’re not only giving back to the industry you love, it’s about being part of the nursery levy decision-making process, as well as obtaining new skills at the same time. What is the most common piece of feedback you receive from growers? There can be a lack of knowledge or uncertainty about the levy however this is usually alleviated once more detail about why the levy exists and the significant platform it creates, is explained. There is an incredible amount of research that’s being conducted and communicating those findings or results to growers, is vital. Growers receive information through various channels, so generating a greater understanding of what information is available where, is important. Why is it important for growers to have their say on future levy investments? A key role of the SIAP is to ensure that the R&D and marketing focus remains relevant for industry and where it’s headed. For growers, we need to continue putting forward ideas and concepts so that we can be on the cutting-edge of production. Research starts from a need or an idea, and some of the best ones come from those on the ground or in the paddock. Growers are the ones observing or experiencing an issue – so it’s important that levy investments focus on addressing those areas to advance the industry. Would you encourage others to get involved in the nursery SIAP? There is a time commitment, but the benefit of being able to contribute to the future of our industry is huge. You gain exposure to interesting people and projects, as well as learn lots of new things along the way. When you give your time and talents, you receive much more in return. And lastly, what are two fun facts that most people wouldn’t know about you? 1. I’ve studied classical piano and play in our local church. The next instrument on my bucket list is acoustic guitar. 2. Even though I’m 6’5, my sons still tower over me! « NGIA NNN CEO Update 31 July 2018	» What research should the nursery industry invest in?